Carative helps elderly loved ones and families with home care and healthcare management. 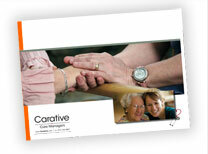 Carative's geriatric care managers provide elder care services and resources to older patients and their families. We are specialists in issues related to aging and elder care, providing personalized support to elderly individuals and their families as they deal with the many challenges faced during the aging process. Our geriatric nurses are available to help individuals manage their often complex medical situation and to assist older adults in reaching their maximum potential. If you would like more information about the services we provide, or to set up an initial consultation for an elderly patient, please contact us. We perform geriatric assessments to identify developing problems with senior adults. If we find issues that need addressing we will discuss the issues, provide appropriate solutions directly or provide referrals to other professionals. Driving evaluations for senior drivers by certified professionals arranged by us. Proud member of the National Association of Professional Geriatric Care Managers.